The discovery that the mutation in the Tg737orpk mouse model of polycystic kidney disease (PKD) affected assembly of cilia in kidney tubules has fueled new interest in primary cilia. These organelles were first described in 1898 (1) and have subsequently been found on most cells in vertebrate organisms (2). (For a comprehensive list of publications on the occurrence of primary cilia, see http://www.primary-cilium.co.uk/.) Until recently, little analysis of the function of primary cilia had been carried out, and there was no strong evidence that linked them to the health and development of vertebrate organisms. Recent research has changed this, demonstrating that primary cilia are important for many aspects of vertebrate heath. The following briefly reviews current research on the importance of primary cilia in the cause of PKD and other diseases. Cilia and flagella are whip-like organelles that project from the surface of cells. These organelles have been widely modified through evolution to provide diverse motility and sensory functions. Motile cilia power the movement of sperm and protistans and move liquid and particles over the epithelial surfaces in metazoans. The sensory functions of cilia are extremely diverse. In vertebrates, sensory functions include the detection of light and odorants in the vertebrate eye and nose and possibly the detection of flow in the kidney nephron (3). In invertebrates, sensory functions include detection of osmolarity changes, chemoattractants, chemorepellants, and sound (4,5⇓). In eukaryotes, whether a particular cilium/flagellum is called a cilium or a flagellum is based more on historical usage than on structure or function, so the terms can be considered interchangeable. However, these organelles should not be confused with prokaryotic flagella or eukaryotic stereocilia. The prokaryotic flagellum is a non–membrane-enclosed extracellular appendage, whereas the eukaryotic flagellum is a membrane-enclosed intracellular organelle. Furthermore, the protein composition of the two structures is different, and they are assembled by independent mechanisms. Eukaryotic stereocilia are microvilli that superficially resemble cilia but have cytoskeletons composed of actin rather than tubulin as is found in cilia. Consequently, the structures are composed of largely different sets of proteins and are assembled by different mechanisms. To confuse the situation, stereocilia and sensory cilia can often play analogous roles in different organisms. For example, in the insect eye, rhodopsin is organized in microvilli (rhabdomeres), whereas in the vertebrate eye, rhodopsin is organized in cilia (rod outer segments). The opposite situation occurs in hearing. In insects, sound is detected by cilia, whereas in vertebrates, sound is detected by microvilli (stereocilia) (5). In the kidney, microvilli are present throughout the nephron but are extremely prominent in the proximal tubule, where they increase surface area to facilitate absorption (6). Whether these microvilli play a sensory role remains to be determined, but it has been hypothesized that they could serve as flow sensors (7) much the way cilia have been proposed to be flow sensors (8). At the core of cilia and flagella is a microtubule-based cytoskeleton called the axoneme (Figure 1). In motile cilia, the axoneme is usually composed of nine outer doublet microtubules surrounding a central pair of microtubules (called a 9 + 2 axoneme), whereas the axoneme of primary cilia is typically composed of the nine outer doublet microtubules without a central pair (called a 9 + 0 axoneme). Other arrangements of microtubules can be found. The axonemal microtubules serve as scaffolding to organize associated protein complexes and serve as binding sites for microtubule-based molecular motors. Most of what we know about the composition of eukaryotic cilia comes from biochemical and genetic studies of the single-celled eukaryote Chlamydomonas reinhardtii. Flagella isolated from this organism contain ∼450 different proteins (9). Currently, 94 of these proteins have been at least partially characterized by biochemical or genetic means. Nearly all of the characterized proteins have close mammalian homologues, as do many of the uncharacterized proteins. Along with proteomic data (10), this suggests that the mammalian motile cilium is equally complex. Primary cilia have not been purified from any source; thus, the composition of their proteome is unknown. It is likely that they share core components with motile cilia and will probably contain several hundred different proteins. Figure 1. Diagram of a kidney primary cilium and associated structures. The primary cilium is composed of a microtubule-based cytoskeleton called the axoneme, which is covered by an extension of the apical plasma membrane called the ciliary membrane. The axoneme of a primary cilium is typically composed of nine doublet microtubules, only two of which are shown here. The microtubules of the axoneme are templated from the basal body, or mother centriole. The daughter centriole is not ciliated. The centrioles are at the center of the centrosome, which is composed of the centrioles and associated pericentriolar material. In addition to its role in cilia assembly, the centrosome serves as the microtubule organizing center in interphase cells, is important for organizing the mitotic spindle during mitosis, and organizes regulatory proteins that control cell-cycle progression and other aspects of cell physiology. Primary cilia are assembled by intraflagellar transport (IFT). During IFT, large particles are transported along the ciliary microtubules by kinesin-II and dynein 2/1b. The IFT particles are composed of at least 17 polypeptides. The Tg737orpk mouse model of polycystic kidney disease has a mutation in the gene encoding the IFT88 subunit (also known as polaris) of the IFT particle. 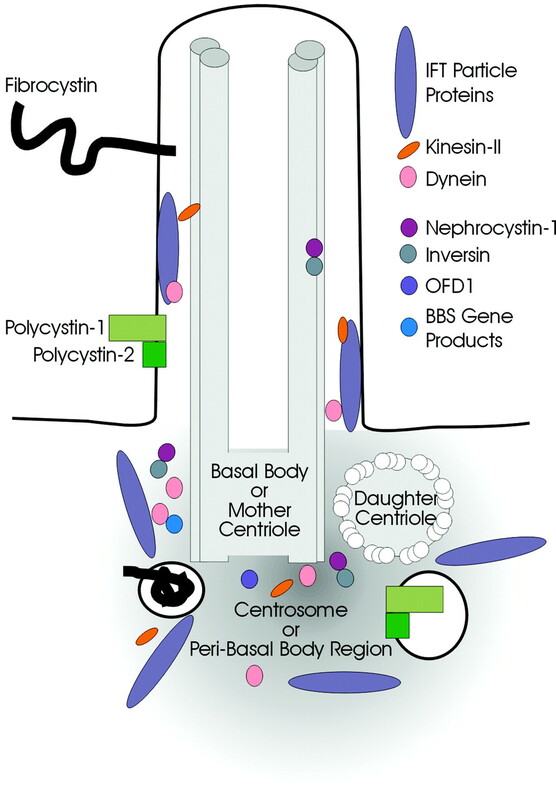 Products of most cystic kidney disease genes have been at least partially localized to the cilium or basal body region (centrosome). The exact locations of the disease gene products in the cilium or basal body region have not been established. The polycystins and fibrocystin are transmembrane proteins and are presumably present either in the ciliary membrane or in membranous vesicles in the cell body at the base of the cilium. The cilium is covered by an extension of the plasma membrane called the ciliary or flagellar membrane (Figure 1). This membrane is continuous with the plasma membrane of the cell but is a separate domain with a unique complement of proteins (11). It is thought that the ciliary necklace, which is a group of cytoskeletal-anchored membrane proteins located at the base of the cilium, serves to isolate the ciliary membrane from the rest of the plasma membrane (12). Available data, albeit limited, suggest that there is a direct pathway for placement of proteins on the ciliary membrane. In algae (Ochromonas and Chlamydomonas), the secretion of the mastigonemes, which are ciliary membrane proteins, seems to occur only at the anterior end of the cell, where the cilia are found (13,14⇓). In Ochromonas, the mastigoneme-containing vesicles were observed fusing with the plasma membrane just outside the cilium (13). It is thought that the fusion site is outside the cilium because vesicles are too large to fit through the constriction or “flagellar pore” at the base of the cilium (see reference 15). A similar situation has been observed with opsin in vertebrate photoreceptors (16). Opsin is a seven-transmembrane protein that is concentrated in the membranes of the photoreceptor outer segment, which is a modified cilium. In the photoreceptor cell body, opsin-containing vesicles seem to be trafficked directly from the Golgi complex to the base of the cilium, where they fuse with the plasma membrane. Once the ciliary membrane protein–containing vesicle fuses with the plasma membrane, the ciliary membrane protein must be directed into the cilium and not allowed to diffuse away into the rest of the plasma membrane. The mechanism by which this is accomplished is unknown. Very little is known about the mechanisms by which ciliary membrane proteins are targeted to this domain. In Leishmania, a sequence near the N-terminus, was found to be necessary for targeting a glucose transporter to the ciliary membrane (17), whereas an unrelated sequence near the C-terminus of opsin was found to be necessary and sufficient for targeting to the outer segment of frog photoreceptors (18). It is not known whether the Leishmania targeting sequence functions as a type of address to direct the protein to the ciliary membrane or functions to retain the protein in the cilium after it has been directed there by other mechanisms. The C-terminal end of mammalian opsin binds to the Tctex1 light chain of cytoplasmic dynein. It has been proposed that cytoplasmic dynein is the motor that transports the opsin-containing vesicles from the Golgi apparatus to the base of the cilium (19). Microtubule polarity suggests that dynein or a minus-end directed kinesin would be responsible for transporting vesicles from the Golgi apparatus to the cilium. The ciliary outer doublet microtubules are templated from the basal body at the base of the cilium. The basal body is composed of nine triplet microtubules cross-linked into a barrel (20,21⇓). The basal body is also known as the centriole, which forms the core of the centrosome. The centrosome is composed of a pair of centrioles and the surrounding pericentriolar material. This organelle serves as the microtubule-organizing center for interphase cells and is also important for organizing the mitotic spindle during mitosis. Recent evidence indicates that the centrosome is involved in controlling cell-cycle progress through cytokinesis and entry in S phase (22,23⇓). Proteomic analysis of centrosomes indicates that like cilia, centrosomes are highly complex and composed of >100 proteins (24). Many of these are coiled-coil proteins and may be structural subunits of the centrosome. However, a variety of kinases and phosphatases, including ones important to G1-S (25,26⇓) and G2-M (27) transitions and to cytokinesis (28), are localized to centrosomes. The centrosome is beginning to be thought of as a central regulator of cell-cycle progression and cellular control (29,30⇓). Eukaryotic cilia and flagella are assembled via a process called intraflagellar transport (IFT). During IFT, large protein complexes are transported along the ciliary microtubules from the cell body to the ciliary tip and then back to the cell body (31). These protein complexes are thought to carry ciliary precursors from their site of synthesis in the cell body to their site of assembly at the tip of the cilium. Several excellent reviews have recently been written about IFT (15,32,33⇓⇓), so I focus on genes that have been genetically characterized in mouse. The IFT particles purified from Chlamydomonas are composed of at least 17 polypeptides (34,35⇓). The IFT particle proteins are rich in protein–protein interaction domains that are likely to be important in holding the complex together and in connecting the particles to the motors and cargo. The mammalian particle has not been purified, but all of the proteins found in the Chlamydomonas particle are conserved in mammals and the mammalian particle is approximately the same size as the Chlamydomonas particle, suggesting a very similar composition (36). Genes encoding IFT particle proteins have been analyzed genetically in several species, including IFT88 (also known as polaris) and IFT172 in mouse. Mutations in the gene encoding the IFT88 subunit completely block ciliary assembly in Chlamydomonas (37) and Caenorhabditis (38,39⇓). In Drosophila, mutations in this gene block assembly of the chordotonal organ cilia but do not block assembly of the sperm flagella, which is assembled in the cytoplasm by an IFT-independent mechanism (40). The Tg737orpk mouse carries a hypomorphic mutation in the gene encoding IFT88, resulting in stunted cilia growth in the kidney (37) and other organs. The mouse is severely growth retarded and develops cystic kidneys, liver biliary duct hyperplasia and dysplasia, polydactyly, and hydrocephaly (41). In addition, the mouse develops pancreatic cysts (42,43⇓), shows photoreceptor rod cell outer segment abnormalities and retinal degeneration (36), has smaller-than-normal testis (hypogonadism), and is male sterile (SanAgustin et al., in preparation). Unexpected, motile cilia in the trachea appear normal when examined by transmission or scanning electron microscopy (Vucica and Pazour, unpublished results). Further effort will be required to understand how this occurs, but it may involve alternative splicing of the message to produce a functional product in this tissue. Null alleles of the gene encoding IFT88 in mouse completely block assembly of the cilia on the embryonic node and result in left-right asymmetry defects and embryonic lethality (44,45⇓). A ciliary assembly defect or a lack of cilia is likely to underlie all of the pathologies seen in the Tg737orpk mouse. The ducts in the kidney, liver, and pancreas, where the pathologic changes are found, all are lined by a ciliated epithelium. The cilia on these cells are likely to play important roles in control of proliferation, polarization, and differentiation (see below). The outer segments of rod and cone photoreceptor cells are developmentally derived from a cilium and can be thought of as highly modified cilia. Thus, a ciliary assembly defect could lead directly to defects in development and maintenance of this structure. Likewise, ciliary assembly defects could lead directly to sperm defects. The mechanism behind hydrocephaly is less clear, although hydrocephaly has also been observed in dogs, rats, and mice with defects in motile cilia (46–49⇓⇓⇓). This suggests that motile cilia in the brain play a role in maintaining proper balance of cerebrospinal fluid. The ependymal cilia in the ventricles would be good candidates as these are defective in the Tg737orpk mouse (50). Likewise, the mechanism behind polydactyly is not straightforward (51) but also has been observed in the hpy mouse with a motile cilia defect (47). Left-right asymmetry defects have been long associated with ciliary defects in human (52) and are thought to be a result of defective cilia on the embryonic node (53–55⇓⇓). Similarly, mutations in the gene encoding IFT172 in Chlamydomonas (35) (Hou et al., unpublished observations) and Caenorhabditis (35,56⇓) block ciliary assembly. In mouse, a mutation in the gene encoding IFT172 results in a phenotype similar to that seen with the IFT88 null allele. It is interesting that the null phenotypes of IFT88 and IFT172 in mice are similar to what is seen when hedgehog signaling is defective. IFT88 and IFT172 have been placed in the hedgehog pathway downstream of Patched1, Smoothened, and RAB23 but upstream of Gli3, suggesting that the IFT system antagonizes production or activity of the Gli3 repressor (45). Whether this indicates a novel role of IFT in cytoplasmic signaling or an additional role for cilia remains to be determined. Work in sea urchins (57), Chlamydomonas (58), and Tetrahymena (59) indicates that heterotrimeric kinesin-II is responsible for transporting IFT particles from the cell body to the tip of the cilium. Mutationally blocking the action of kinesin-II in Chlamydomonas and Tetrahymena completely prevents ciliary assembly. In sea urchins, injection of a function-blocking antibody prevented most ciliary assembly; however, short pro-cilia were still formed, suggesting that another motor may play a role in the early steps of assembly. In Caenorhabditis, mutation of the kinesin-encoding osm-3 gene prevents cilia assembly, but OSM-3 does not seem to be a typical heterotrimeric kinesin-II (60). Caenorhabditis contains a typical heterotrimeric kinesin, but mutations in these genes have not be reported, so their involvement in IFT is unknown (60). Null mutations in the genes encoding either of the motor subunits of kinesin-II in mouse block ciliary assembly on the embryonic node and lead to embryonic lethality (53–55⇓⇓). Targeted deletion of the KIF3A kinesin-II subunit in the retina after rod outer segments had formed resulted in accumulation of membranous material in the inner segment at the base of the connecting cilium and a retinal degeneration phenotype (61). Targeted deletion of this subunit in kidney epithelium blocks assembly of primary cilia (62), which is discussed more below. The mammalian orthologue of C. elegans OSM-3 is KIF17. This protein has been implicated in neuronal transport of NMDA receptors, and overexpression is reported to improve working memory (63), but the involvement in ciliary assembly has not been examined. Dynein 1b/2 carries the IFT particles from the ciliary tip to the base of the cilium. This isoform of dynein is phylogenetically approximately equally related to the major isoform of cytoplasmic dynein as it is to axonemal dyneins involved in flagellar motility (64). Mutations in the genes encoding the motor subunit of this dynein in Chlamydomonas (65,66⇓) and C. elegans (67) cause the cells to form short cilia that are filled with IFT particles. Apparently, kinesin-II transports the particles into the cilium, which accumulate as a result of the lack of a motor to return them to the cell body. Dynein2/1b also contains a light intermediate chain called LIC3, D2LIC, or D1bLIC. Mutations in this gene in Caenorhabditis (68) and Chlamydomonas (69) cause a retrograde phenotype similar to that seen by the motor subunit mutations. This phenotype is also seen by mutations in the 8-kD dynein light chain in Chlamydomonas (70). No mutations in any of these genes have been reported in mammals, although the heavy and light intermediate chains are found localized to the Golgi apparatus as well as the basal body region (71–73⇓⇓). Injection of antibodies against the heavy chain dispersed the Golgi complex, but it was not reported whether this also affected ciliary assembly (71). The first indication that ciliary defects could lead to PKD came from analysis of the Tg737orpk mouse. This mouse was identified in a screen of insertional mouse mutants as having cysts in the kidney and pancreas, hepatic fibrosis, hydrocephaly, and polydactyly (41). Kidney and pancreatic cysts in combination with hepatic fibrosis are similar to what is seen in humans with autosomal recessive PKD, and this mouse became one of the models for this disease (74). The Tg737 gene product (IFT88 or polaris) is a subunit of the IFT particle (37). As discussed above, mutations in the gene encoding IFT88 in Chlamydomonas, Caenorhabditis, and Drosophila block the assembly of cilia (37–40⇓⇓⇓). The Tg737orpk allele was generated by integration of exogenous DNA into an intron. This results in a hypomorphic allele (41), which impairs but does not completely block assembly of kidney cilia (37). Complete null alleles of this gene are embryonic lethals, precluding analysis of the assembly of kidney cilia. These embryos lack cilia on their nodes (44), supporting the idea that the primary defect in the Tg737orpk mouse is an inability to assemble cilia. Additional evidence that ciliary assembly defects lead to PKD was provided by analysis of targeted knockouts of the KIF3A subunit of kinesin-II in kidney epithelium (62). Kinesin-II is a heterotrimeric kinesin that is involved in vesicular transport in neurons and melanosomes, transport between the endoplasmic reticulum and the Golgi complex, and transport of IFT particles from the cell body to the ciliary tip (75). Complete deletion of KIF3A leads to embryonic lethality at day 10 post coitum (53,55⇓) precluding analysis of kidney development. For overcoming the embryonic lethality, the cre-lox system was used to delete KIF3A specifically in kidney epithelium after birth. As discussed above, kinesin-II is required for ciliary assembly in mouse, and deletion of KIF3A in kidney epithelium resulted in absence of cilia on these cells. Cyst formation followed the loss of cilia in these kidneys, supporting the idea that ciliary assembly defects can lead to cyst formation. However, the involvement of kinesin-II in multiple other transport pathways (75) requires caution to be used in the interpretation of these results. Additional evidence that cilia are central players in PKD came from a genetic analysis of zebrafish mutants (76). Sun et al. (76) identified 12 complementation groups that cause cysts in the pronephros of fish embryos and cloned the corresponding genes for 11 of these. Of these 11 genes, three encoded subunits of the IFT particle (IFT172/curly, IFT81/larry, IFT57/mo), one (scorpion) blocked ciliary assembly by unknown mechanism, and another two (pkd2, qilin) encoded proteins known to be localized to cilia in other organisms. Thus, of the 11 genes identified in this screen, six are connected to cilia and four are involved in ciliary assembly. Primary cilia are thought to be sensory organelles that organize receptors and early steps of signal transduction cascades that monitor parameters outside cells (reviewed in reference 77). The leading hypothesis linking ciliary assembly defects to PKD proposes that the proteins that are responsible for monitoring the need for epithelial cell division are localized to cilia. The mechanism by which epithelial cells determine the need to proliferate is not clear. However, the cloning of genes that are responsible for PKD in human and mouse has identified several candidates for components of the signal transduction cascade. Most of the products of human cystic kidney disease genes are at least partially localized to the primary cilium or basal body/centrosomal region. These include polycystin-1 and -2 (78–80⇓⇓), which are defective in humans with autosomal dominant PKD (81,82⇓). The ciliary level of polycystin-2 is elevated in the kidney of Tg737orpk mice, suggesting that IFT plays a role in recycling this protein back to the cell body or in maintaining the proper level in the cilia (78). Ciliary localization of epitope-tagged polycystin-2 (83) has also been observed, providing confirmation of the immunofluorescence results obtained with antibodies directed against the native protein. In addition, mice with a targeted knockout of PKD2 show left-right asymmetry defects (84), which are a common phenotype caused by ciliary mutations in humans (52) and rodents (85). Bending kidney primary cilia elevates cellular Ca2+ (3). This response is blocked by mutations in polycystin-1 or addition of antibodies against polycystin-2. It has been proposed that this is the mechanism by which the polycystins monitor the state of the kidney epithelium and the need for cell division (80). Fibrocystin or polyductin, the product of the PKHD1 gene, which is defective in humans with autosomal recessive PKD, has also been shown to localize to cilia and basal bodies (86–89⇓⇓⇓). This large ∼450-kD protein is predicted to have a single transmembrane domain near the C-terminal end with a large extracellular domain (90,91⇓). The protein is conserved in Chlamydomonas but not in nonciliated organisms such as Saccharomyces and Arabidopsis, which is consistent with a ciliary function. Reducing the amount of fibrocystin in ciliated liver bile duct epithelial cells shortened the cilia on these cells to ∼40% of normal (89). The mechanism by which this occurred is not clear. It may be that fibrocystin is required for assembly of cilia in a way analogous to the Tg737 gene product (37). However, unlike the Tg737 gene product, fibrocystin is not a known subunit of the IFT particle. Alternatively, fibrocystin may be a structural protein of the cilium and have no involvement in ciliary assembly. Several examples are known in Chlamydomonas, where defects in structural components affect flagellar length even though the affected proteins are not thought to be involved in ciliary assembly (e.g., reference 92). The products of the nephronophthisis disease genes are also connected to cilia. Nephronophthisis is a cystic kidney disease that is associated with retinal degeneration in ∼10% of cases. When the two disorders are found together it is called Senior-Loken syndrome. The NPHP1 gene product nephrocystin-1 (also called nephrocystin) is an SH3 domain–containing protein (93). This protein was found in a proteomic analysis of human respiratory cilia (10) and was shown to localize to cilia in cultured kidney cells (94). Nephrocystin-1 co-immunoprecipitates with the NPHP2 gene product inversin (94). Mice with defects in inversin have left-right asymmetry defects and develop cystic kidneys (95,96⇓). Inversin is an ankyrin-repeat protein that can be found associated with centrosomes (97–99⇓⇓) and cilia (94,99⇓) in tissue culture cells, and GFP-tagged inversin localizes to cilia in mice (98). The role of inversin in cilia is controversial, and it has been proposed that the left-right asymmetry defect may be due to nonciliary inversin (97). Nephrocystin-3 (100) and nephrocystin-4 (also called nephroretinin) (101,102⇓), which are the gene products of the NPHP3 and NPHP4 genes, have not been shown to localize to cilia or basal bodies. However, nephrocystin-4 co-immunoprecipitates with nephrocystin-1 (102), suggesting that it will co-localize with nephrocystin-1 in the cilia. Bardet-Biedl and Oral-Facial-Digital syndrome gene products have also been localized to basal bodies or centrosomes. Bardet-Biedl syndrome is a relatively rare disorder that typically includes obesity, mental retardation, hypogenitalism, pigmentary retinopathy, renal defects including cystic kidneys, and, in some cases, polydactyly. This disorder seems to be very genetically heterogeneous with seven genes cloned thus far. Very little is known about the functions of these except that BBS6 encodes a chaperonin-like molecule (103). Like the PKHD1 gene discussed above, most BBS genes are conserved in Chlamydomonas but not in yeast or plants, suggesting a cilia or basal body function. Consistent with this, BBS4, BBS5, BBS7, and BBS8 localize to basal bodies and centrosomes (104–107⇓⇓⇓), and BBS7 and BBS8 are reported to traffic along cilia in C. elegans similar to IFT proteins (107). In cultured mammalian cells, reduction in the amount of BBS4 seems to impair centrosome function in organizing interphase microtubules and causes cell-cycle arrest and apoptosis (105). It is interesting that mice homozygous for null alleles of BBS4 are viable (108). These mice do not assemble sperm flagella, but other types of cilia seem to assemble normally. The cilia may not be properly maintained as rod outer segments show age-related degeneration (108). Likewise, the product of the Oral-Facial-Digital-1 gene OFD1 localizes to centrosomes (109). The OFD1 gene is located on the X chromosome, and affected females typically have abnormalities of the oral cavity, face, and digits including polydactyly, whereas XY males die in utero. Kidney and pancreatic cysts are also observed. OFD1 is a coiled-coil protein (110) that purifies with centrosomes (24) and co-localizes with γ-tubulin at the centrosome (109). At this point, it is clear that ciliary assembly defects can lead to cystic kidney disease and that many of the products of human cystic kidney disease genes are at least partially localized to cilia. However, the mechanism by which this works is still being elucidated. I favor the idea that cilia serve as cellular antennae by organizing receptors and early steps of signal transduction pathways needed to monitor the cell’s extracellular environment. Thus, receptors for monitoring the state of the epithelium and proteins to amplify this signal and transmit it to the cell body need to be localized to the kidney primary cilia analogous to the way that photoreceptors, heterotrimeric G-proteins, phosphodiesterases, and cyclic nucleotide gated channels all are localized in photoreceptor cilia in the retina. The polycystins are the lead candidates for the initial steps of this pathway. The observation that the polycystins are required for detecting flow suggests that flow may be the critical parameter in monitoring the need for proliferation and preventing cyst formation (80). However, more detailed experimentation is needed to explain how the cell integrates changes in flow rates that result from dehydration versus those that result from enlargement of the nephron as well as flow rate changes that occur along the length of the nephron as a result of absorption. Furthermore, extrapolating this to other vertebrates such as fish that have motile cilia in the ducts (111) is problematic and needs to be addressed. Work in my laboratory is funded by the National Institutes of Health (GM-60992) and the Worcester Foundation for Biomedical Research. I thank Drs. George Witman, Joel Rosenbaum, Yvonne Vucica, and Bethany Walker and two anonymous reviewers for critical comments on this manuscript.